It's Lotus Creation Academy's GRAND OPENING on March 16th! The event will be semi-formal attire so come dressed to impress! Classes are 50% off, $10 each! There will be food, press, raffles, and special performances by the students of Lotus! We will be taking pledges of $10, $20, $50 and $100 to help us with our new studio renovations. 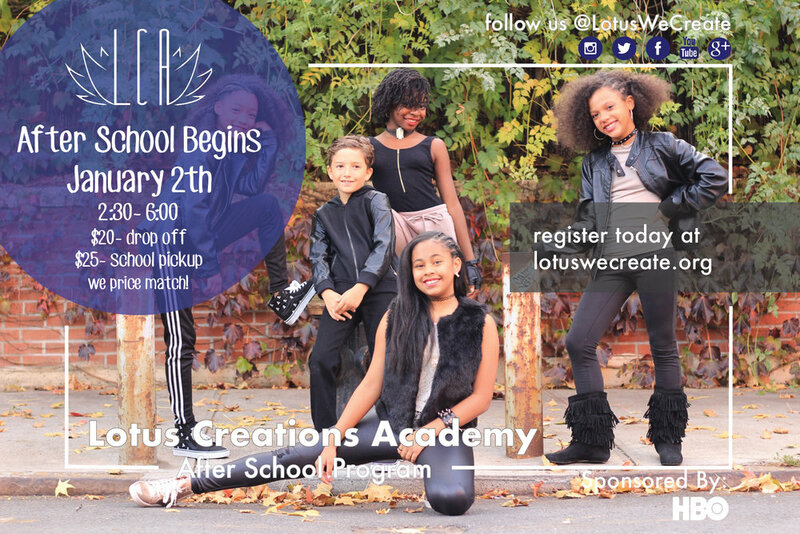 We are excited to announce the start for Lotus Creations Academy's spring semester and after school program. Register here to reserve your child's spot today. Don't forget to ask about our price match! Get your tickets for our Fall 2017 Recital today! Join us for our Halloween party and come dressed in a spooky costume! Let's Dance to Help Hurricane Survivors on #WorldFoodDay! Monday, October 16th, is World Food Day - and Lotus Xposure's next performance! World Food Day is celebrated each year to mobilize global awareness and action for those who suffer from hunger. Food Tank is hosting a unique event in partnership with Broadway Stars called "Dance for Hurricane Recovery!" The event is being held in NYC at the Union Square Ballroom on Monday, Oct 16 from 5:30PM-7:00PM. 2017 Fall Semester begins on September 7th. Register today! Lotus Xposure goes to Chicago to for their first out of state performance! Save the date for our Spring Recital at Irondale Ensemble Theatre. Are you fit for dance? Get fit with Sherille and Rambo this spring! Talk to your child's dance instructor to find out how things are going in class. Help Lotus Creations raise money for our very own location in Clinton Hill. Lotus Travel Team will be performing at the Living Gallery to support The Magnolia Women's Shelter. Come out and enjoy brunch and mimosas while supporting a beneficial cause. Are you looking for something to do during the summer? Are you motivaed and need an internship to gain real job experience, want to be a part of a team or just need something fun to do? Come to the informational Youth Summer Resource Expo. Join the Travel Team as they imagine the future of Crown Heights and all of Brooklyn with this performance hosted by Councilwoman Laurie Cumbo!